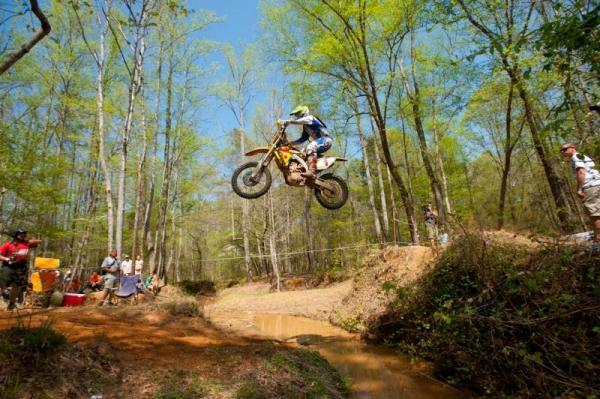 (April 10, 2011) - Charlie Mullins got win number two on the year at the Pirelli Big Buck GNCC in Union, South Carolina, the Ohio rider making amends for a crash in the final turn at the previous round in North Carolina where he threw away a certain victory. Mullins was not about to let anything get in the way of a win in South Carolina, and grabbed the $250 Motosport.com Holeshot Award to start the race before leading FMF/KTM teammates Kailub Russell, Russell Bobbitt and Cory Buttrick into the opening lap. Charlie Mullins got win number two. On lap three, Russell took the lead when Mullins stalled his bike in a tight turn. However, Mullins regained the top position after Russell slowed up on pit lane. With one lap to go, FMF/Makita Suzuki rider Josh Strang made good on a race-long charge that carried him to within 30 seconds of Mullins. However, Strang came up short in his quest to catch Mullins, and Mullins took the checkered flag with 14 seconds to spare. "This feels pretty good," said Mullins. "It's a little bit of redemption after what happened at Steele Creek. Luckily, I had a bit of a cushion on the last lap and I was able to cruise in for the finish." Josh Strang finished a close second. Josh Strang was a close second.Mullins had a scare when he hit a rock and got sideways with less than a mile to go, but he was able to save it and avoid another last lap disaster like Steele Creek. "I'm just lucky I didn't go down," said Mullins. "I couldn't take another finish like that." For Strang, it was a case of too little too late. "I caught up with Charlie fairly easy there on the last lap and I think I should have won it," said Strang. "I felt good today but I just let those guys get away too much early on. I just ran out of time and had too much distance to make up at the end." Russell finished the day in third, the first podium of his XC1 career, despite feeling the effects of a sinus infection. Kailub Russell got his first XC1 podium. "I got out front early with Charlie and we kind of checked out," said Russell. "But I've been sick and couldn't breathe good and after that I started fading pretty bad." Buttrick made a late race pass on Bobbitt to claim fourth, with Bobbitt taking fifth ahead of Am-Pro/FMF/Yamaha's Paul Whibley. WMR/Planet Fitness/KTM's Nate Kanney finished seventh, while Beta's Chris Bach, JG Off-road Racing/GEICO Powersports Honda's Jimmy Jarrett and factory Husaberg rider Michael Lafferty rounded out the top 10. Kailub Russell got his first XC1 podium. With four rounds in the books, Mullins sits atop the series points standings with 100 points, compared to Strang at 98. Whibley is third with 73. Steward Baylor Jr. came out on the winning end of a fierce two-way battle with Am-Pro/FMF/Yamaha's Jordan Ashburn to win the XC2 class, the KTM-mounted Baylor getting the nod by 35 seconds at the finish. It might have been closer but Ashburn fell within a half mile of the finish, leaving Baylor to take the checkers uncontested. Baylor led early on, but Ashburn came on strong in the second half of the race to set up the last-lap showdown. Steward Baylor Jr. won the XC2 class. "Steward passed me on the last lap and I passed him back," said Ashburn. "He got me again about halfway into the lap and it was neck-and-neck after that. I had a pretty hard crash just before the finish, but it was a great race anyway." 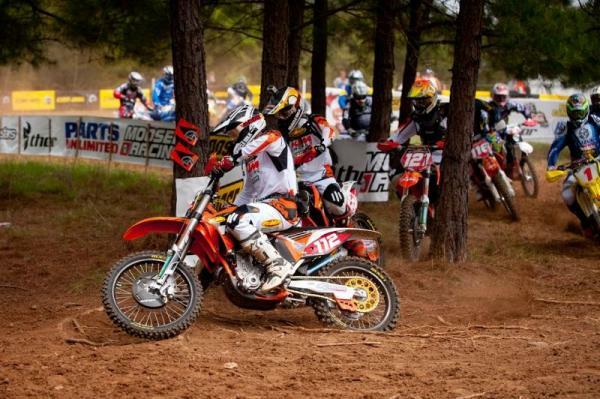 FAR Husqvarna's Jason Thomas rounded out the podium despite injuring his toe in the first hour. "I was riding good at the start but I came into the tight section and there was a lapper in front of me and I made a mistake and hit a tree wide open," said Thomas. "After that I couldn't get back up with those guys." Fourth went to Pennsylvania KTM rider Andrew DeLong, while JG Off-road/GEICO Powersports Honda's Scotty Watkins was fifth. Steward Baylor Jr. won the XC2 class. 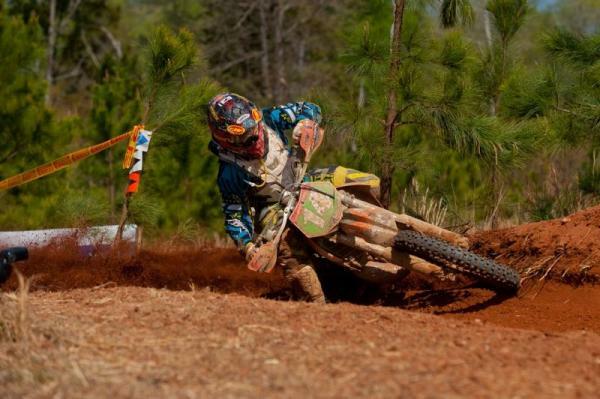 Virginia Hare Scrambles Champ Brad Bakken was sixth on a KTM, followed by FAR Husqvarna's Morgan Moss and Yamaha rider Cody Cragg. R2W/Pro-Action KTM's Shane O'banion was ninth and also took home the $100 Motosport.com Holeshot Award. 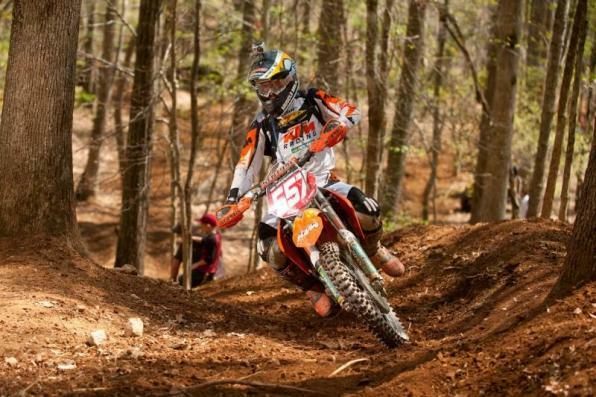 Meanwhile, Zachery Smith rounded out the top 10 on a KTM. Baylor regained the XC2 points lead with the victory, however Thomas has been on the podium at every race and his consistency leaves him just four points back in the standings. Top Amateur in the afternoon was Christopher Meadows, finishing 23rd overall on a KTM. In the A.M. race, six-time National Hare Scrambles Champ Jason Raines capitalized on a great start to take the overall win, beating out fellow Yamaha rider Tyler MacDonald and KTM-mounted McKinnon Welborn. Dennis Decker rode a Suzuki to first place in the Super Senior A (45+) class with Eric Gill finishing second on a KTM and Hunter Houck finishing third on a Yamaha. In the Women's division, KTM's Maria Forsberg took the win over Mandi Mastin (Hsq) and Hanna Otto (KTM). In the Youth race, Anthony Stone held the early lead but fellow KTM rider Austin Lee made a pass on the final lap to claim the overall victory. Lee also took the win the Super Mini (12-13), while Stone topped the Super Mini (14-15) class. Jonathan Johnson took the 85 (14-15) win on his KTM, beating out Kawasaki riders Christopher Williams and Nick Lujan. In the 65 (10-11) class, KTM riders filled the podium with Zachary Ponder getting first ahead of Chase Hayes and J.C. Bates.